Here are our top tips on building effective company newsletters which your employees will want to read. Internal news (e.g. new employees, updated policies, employee of the month, staff social events) – This only needs to be sent to company employees and can take a more informal and relaxed tone. Investor relations (e.g. financial information, share prices, new mergers/partnerships) – This is relevant for shareholders and investors and requires a formal and professional tone. Individual department updates (e.g. marketing update, social media analysis, HR protocols) – These are only relevant for certain groups within your business and should adopt a professional tone where appropriate. General company news (e.g. awards and achievements, management changes, CSR news, new products) – This news is relevant to anyone with an interest in your business and can be sent to your entire mailing list. Once you’ve identified which kind of newsletter you want to send, you can start planning the content you want to share with your readers. Try and identify a key story or topic which you can use as the main theme of your email to help draw your readers in. You can also use the email subject to immediately communicate this theme to readers and increase the chances of your email being read. Decide on a main newsletter theme and include in your subject line to draw readers in. As a manager or team leader, you can use your company newsletter to speak to your whole team on an informal level. This is especially important if you have a larger team you don’t get to interact with often. By keeping the tone friendly and conversational, you will come across more approachable to team members and employees. The key to building up a good email layout is to include a balance of text and images. This breaks up your email and makes it much more appealing to readers. In Mail Designer 365, there is a wide variety of layout options to help you build a newsletter which looks professional. Use the 4 column layout block for longer news stories. Features such as employee of the month are a great way to boost morale and praise good work. Sharing good news with your colleagues is another way to keep spirits high. However, you should also remember to stay positive during difficult times. If your team is under-performing, use your newsletter as a way to motivate them to do better. Features such as employee of the month are a great way to boost morale. You should try and keep newsletters as consistent as possible so your readers know what to expect. This includes aspects like the color scheme, newsletter title, font, and layout. You could also include regular features like quotes, event calendars, or a comic strip to keep readers engaged. By sticking to a trusted format, you also have a reliable template for future designs. Tip: You can build one master template in Mail Designer 365 which you can duplicate and edit whenever needed. This way, you keep a consistent style and don’t lose your formatting. 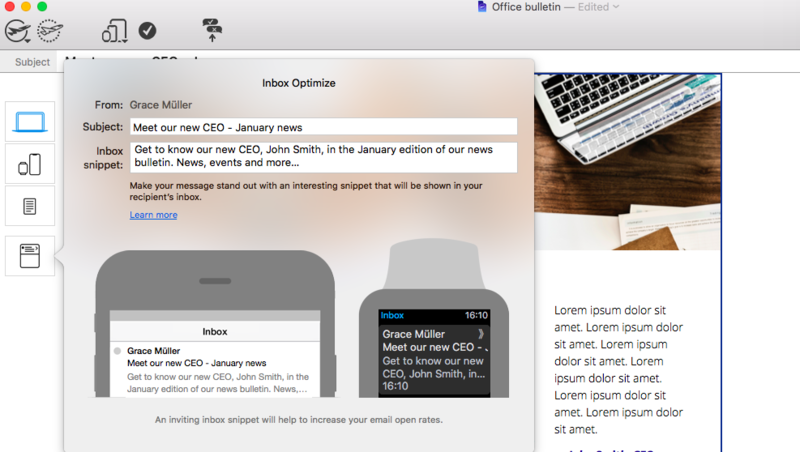 Duplicate newsletter templates to keep your styles and formatting for next time. Whether you are a small business, a large corporation, or a smaller team within a big organisation, you should be able to find a sending schedule which suits you. Although this doesn’t have to be exact, it is good practice to establish some sort of pattern so you are keeping in regular contact with your employees or shareholders. Try and incorporate regular features into your newsletters to keep employees interested. Stay consistent with your newsletter design and your sending schedule. We hope you found these tips for building a company newsletter useful. Remember, you can try out these tricks in Mail Designer 365 by downloading the app free from our website!